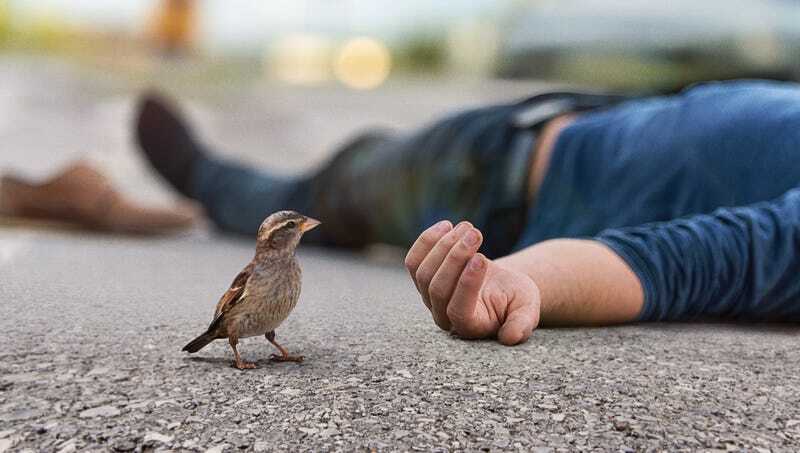 PITTSBURGH—Alighting on the concrete to study the colorful but lifeless body, a sparrow reflected on the fragile and fleeting nature of life Thursday after coming across a dead human on the sidewalk. “Looking at it, so still and delicate, lying there on the ground, it just reminds you that each and every one of us has but a short time to spend on this Earth,” said the migratory grassland insectivore, admitting he didn’t usually take time to think about the nature of mortality, but that seeing a lifeless human sprawled on a sidewalk, on a lawn, or even rebounding limply from the windshield of a passing car, was enough to make anyone stop and think. “The poor thing. Sad that it probably died all alone. Life really is all the more precious for being temporary, you know? I’m just glad my species abandons its fledglings after roughly 20 days—I’d hate to have to talk to my kids about this.” At press time, the common raven to whom the sparrow had been speaking noted that the dead human’s eyes were delicious.